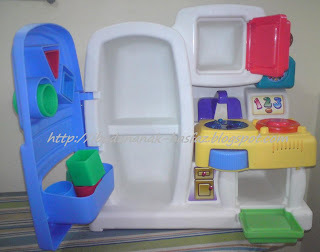 * The Activity Center by Fisher-Price is a crib toy with many fun activities to keep baby busy and entertained. * Attaches easily to the crib with adjustable straps. * there is a carry handle for take along play. - crib toy with many fun activities to keep baby busy and entertained. "Buckle up!" chirps a young voice when little drivers twist the plastic key to start their See Me Go! Driver. * Designed for small laps and big imaginations, includes a chunky steering wheel, horn, turn signal, rotating rearview mirror, and gearshift. - "Let's go to school!" when they push the six activity buttons on the dash. * Twisting the key to the music note elicits familiar tunes when the same buttons are pressed. 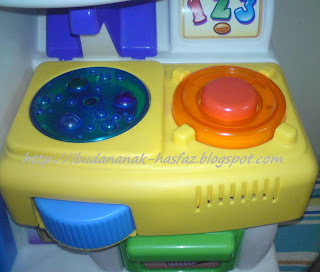 Your baby will quickly learn how to press the buttons. * Press the button on front page to hear the full Twinkle Twinkle Little Star song. * On each page of the book there is a button to press which will play the corresponding part of the song to the words on the page. * moving characters and three ways to play. * Listen to melodies as notes from the songs magically light up, step-through a song note-by-note, or learn to play a tune by following the lights. - the crayons pop up and down from the top of the piano. Features four melodies. - Requires 3 "AA" alkaline batteries (not included). * It was made to go on a crib or a stroller and has velcro straps to tie it on. * learn and explore shapes, colors, counting and music. * As each shape is sorted, special surprises pop up to reward and engage babies. * comes with 4 colorful shapes. * Help little learners sort each one to hear its name and color, plus numbers from 1 to 4. 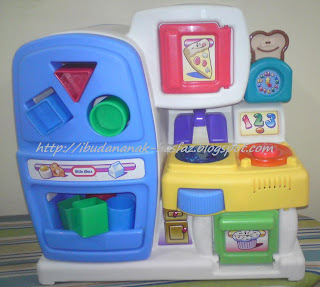 * Features 3 play modes, volume control and a music button that plays a fun baking song when pressed. * see-through door lets little bakers see what they've made. * Requires 3 "AA" batteries (not included). * Seat adjusts to 3 different heights for child's comfort. * Requires 3 "C" alkaline batteries (not included).